From Proto Nuclear Polynesian *Malili Terminalia sp. (Combretaceae). 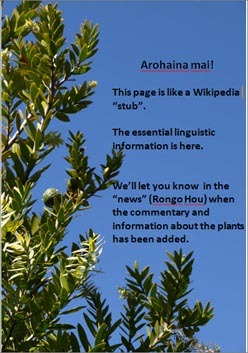 It seems that the similar appearance of the ripening fruit of this forest tree beloved by pigeons reminded some of the early Polynesian arrivals in Aotearoa of the ripening fruits of the tropical mālili. See linked page to the Proto Nuclear Polynesian word for a discussion of the multiple meanings of this word -- or possibly once two words, one for the tree and another for the falling, withered or fallen fruit. References and further reading: See the notes to tawa and *malili. 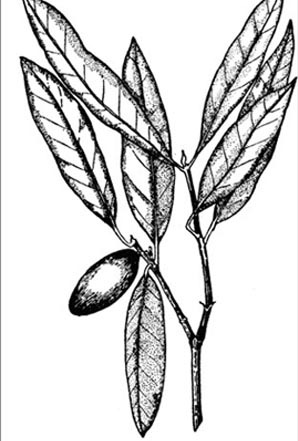 Photographs: The illustration of the tawa leaves and fruits comes from An Encyclopaedia of New Zealand, ed. 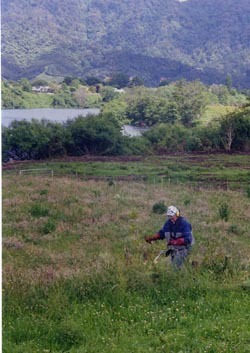 A. H. McClintock (1966) republished with Te Ara - the Encyclopedia of New Zealand: http: //www.TeAra.govt.nz/en/1966/26245/tawa-beilschmiedia-tawa. 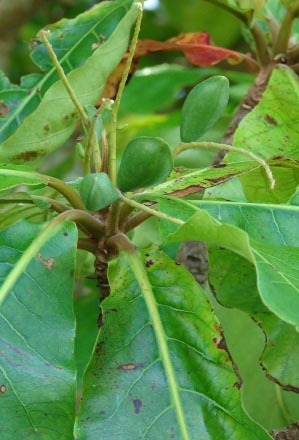 The photograph of the unripe mālili fruit is by Forest and Kim Starr, Hawaii. Both illustrations have been cropped.